Croatia is a very suitable destination for those with holidaying with babies and toddlers (or, indeed, children of any age!) as the country is very family- and child-friendly, and the safe beaches and largely still waters mean its a great beach destination. However, we know (from personal experience, now!) that travelling with kids is completely different to travelling by yourself or in a couple or group. So here are our tips for travelling to Croatia with babies and toddlers to try and make your life easier! This baby’s already at the beach! If you’re travelling with very young children (under the age of 2), almost all airlines that fly to Croatia will let you travel with two items of baby equipment free of charge (in addition to your luggage). Baby equipment most commonly includes pushchairs, car seats and travel cots. Airports in Croatia will let you take your pushchair up to the gate, when you can then give it in to be taken into the hold of the plane. You will need to put your pushchair through the x-ray machine when going through security, so be prepared to quickly scoop up your child and fold your pushchair. Check with your accommodation whether or not they can provide a cot for your child. Hotels should definitely be able to, and many private apartments should as well. Airports do have baby changing facilities, but these are most commonly just a baby changing table in one of the ladies’ toilets! Still, that’s better than nothing… Zagreb Airport has a completely new building as of 2017, so that does have proper baby changing facilities. Most airports in Croatia are pretty small with few amenities (shops, cafes and so on). Baby items (food sachets, milk, nappies) aren’t available to buy, so do always bring your own when at the airport. By law, children under the age of 5 can only travel in the back seats of a car in a child seat that is properly secured to the car (either with a seatbelt or a mechanism such as ISOFIX). A child under the age of two is permitted to be placed in the front passenger seat as long as they are secured in an appropriate car seat that is rear facing, and as long as the passenger airbag has been deactivated. Children aged between 5 and 12 must also travel in the back seat of a car using a seat adjusted to their height (i.e. a booster seat) and using the three point seatbelt. Children must always be secured in their child seat using the supplied harness or car seatbelt if older. Failure to adhere to the above rules can result in a fine. However, you will most likely see plenty of children being driven around in cars NOT in appropriate car seats, often in someone’s lap and often in the front seat! The police don’t always enforce these laws strictly, often turning a blind eye to those breaking the law. All of the above items are readily available in Croatia. For the most choice, we would recommend heading to one of the larger versions of a supermarket close to where you are located – you may find a Kaufland, Lidl, Konzum, Tommy and Spar near to you. Even smaller versions of these stores will stock some baby items, but these smaller stores may not the widest selection (e.g. a small selection of baby food, some baby toiletries, some nappies but perhaps not all sizes, unlikely to have baby milk). Pharmacies will also stock baby products, as well as having a decent selection of items of those with food intolerances if you need to look for these. DM is one of the largest chains in Croatia. Readily available, you’ll find stocks of Pampers (all types and sizes) everywhere! Other brands are also available. 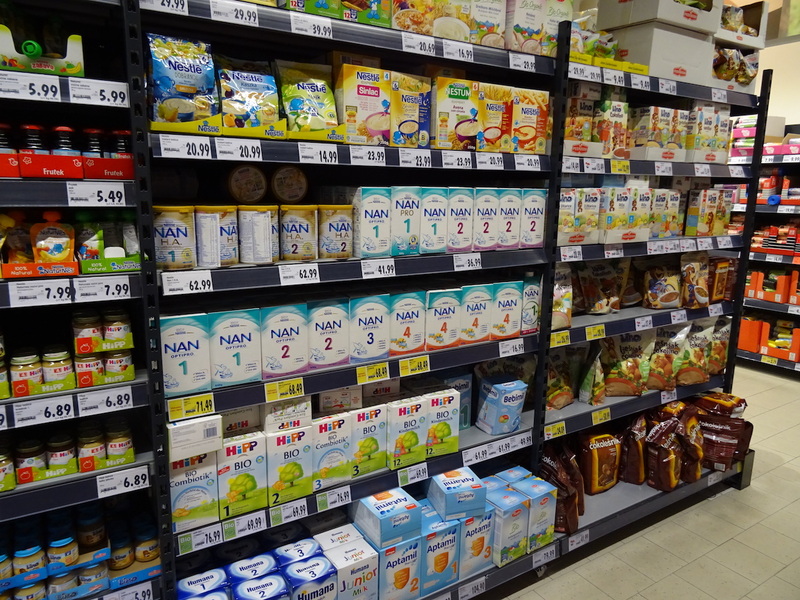 Usually only in larger supermarkets (and pharmacies/drugstores), where you will find a good range of powered baby milk. Brands we’ve seen for sale include Aptamil, Hipp, (Nestle) Nan Optipro and HA, Humana and Bebimil (Croatian brand). We haven’t seen ready made baby milk available, so you may wish to take supplies of this on holiday with you if that’s what your baby drinks. Obviously cow’s milk is easily available, and larger supermarkets will also sell other milk such as soy, almond, oat, hazelnut, cashew, rice, coconut (the Alpro brand seems popular). Readily available. Most baby food comes in jars, and there appears to be few baby food in sachets (that are now so common in the UK, for example). A few fruit sachets may be available to buy. HIPP food jars are easy to find, as well as local brands Frutek and Lino, plus some Nestle baby food products. Baby cereals are also on sale – include Nestle and local brand Lino’s ‘famous’ Cokolino (chocolate flavoured porridge!). Lino do also carry other flavours if you don’t fancy giving your baby a chocolate breakfast! One thing we didn’t find to buy were equivalents of baby-friendly breakfast cereals such as Ready Brek or Weetabix. You may wish to bring your own supply of these if baby/toddler won’t eat anything else for breakfast! A decent selection of bottles, teats, cups and similar but not all brands are available – Phillips Avent products seem to be most common. Tap water is perfectly safe to drink in Croatia. Obviously, bottled water is also readily available. If your child has food allergies, you may find our special dietary requirements in Croatia guide useful. Only you know how your toddler will like visiting the sights of Croatia! Whether you largely need to stick to the pool/beach during your holiday, or think you can brave a bit of sightseeing is up to you! However, one form of entertainment that all kids love is playgrounds. You’ll likely see one of these – even a small one – wherever you’re staying. And this will probably be far more interesting to your child than a Roman Emperor’s palace! There are ramps into the Old Town at both the Pile and Ploce Gate entrances, so you can definitely get in to the Old Town. Avoid any of the other ways in which you’ll encounter many stairs! Once there, Stradun and the nearby streets are largely flat. Involves many, many steps as well as wooden walkways which don’t have any railings. We’d suggest waiting to visit until your kids are out of prams and are likely to walk sensibly (i.e. not run around without listening to you!). For babies, if you’re willing to use a carrier (and feel safe using one whilst walking around the Park, including on the many steps), this may be one way of visiting. If you do the loop involving Skradinski buk, this is much more do-able than Plitvice. The walkways again don’t have railings, so you would need to use a stroller or a harness for a toddler. There aren’t too many stairs (although some – mostly towards the end) so most of the walk is flat. Where there are stairs there are ‘alternative’ routes which are covered in gravel – this is hard to push a pram on, so you may just decide to carry it up the stairs anyway! At Skradinski Buk you can go swimming. However, the water gets quite deep (deep for small children, not adults) quite quickly and there are also slippery rocks on the waterbed. Children would need careful supervision when swimming, therefore. The main part of the city (Diocletian’s Palace) is mostly flat without too many stairs. Easy to navigate with a pram. Getting to the islands isn’t too much of a problem – there’s ramps up onto the boats, although you’ll likely encounter a step or two into the main cabin. For larger car ferries, you will need to ascend from the car deck where you enter (whether in a car or not) up to the main passenger deck. Once on the islands, you shouldn’t encounter any issues with pushing a pram around. These aren’t all that common in restaurants in Croatia, unfortunately! If you plan on eating out often, you may like to consider bringing along something like a baby chair harness, which are small, light and easy to carry. Modern hotels, especially family friendly ones (of course!) will have high chairs. These are few and far between, unfortunately, when you’re out and about in public. In our experience if you’re at a restaurant, for example, you can always ask a waiter/waitress if they can accommodate you and your baby somewhere to change him/her. A restaurant in Split kindly set up a private little table for us just by the main toilets. Otherwise, you shouldn’t have any issues with changing babies on the beach or in a park, for example. Thank goodness the good weather makes this sort of thing easy! If you’re heading to Croatia in summer – and you probably are – it’ll most likely be HOT. It’s not uncommon for temperatures to reach into the 30s Celsius and most days will be pretty sunny. So do make sure that you use plenty of high factor suncream and dress your youngsters appropriately, as well as keeping them in the shade as much as possible. Many beaches in Croatia have sun umbrellas and sun loungers for hire, so you may wish to make use of these if hitting the beach. Alternatively, you may like to purchase something like a pop up sun tent to keep your youngster(s) in the shade. If you’re an EU visitor, do make sure you sign up your children (as well as yourself!) for an EHIC card. This gives you the right to receive medical treatment in other EU countries either for low cost or free. UK residents can sign up for an EHIC card here. Check online if you’re resident in another EU country. Do always remember to have appropriate travel insurance for your family as well. Read more about safety and healthcare in Croatia.